Calling all mushroom lovers… Oh wait, you are already here. But what you may not know, is that mushrooms are some of the most powerful natural remedies in the world. So, when the holidays are upon us, it is a good thing to include their immune system boosting properties on your plate – any way you can get them in the form of stuffed mushrooms, mushroom gravy over meatballs, or grilled mushroom skewers with balsamic sauce. If you are still thinking “yum”, then you are on the right page, looking at the right recipe. Perhaps it is your fate to eat mushrooms for dinner tonight, or to find a dish that will encourage your kids to like them too. Either way, make sure that some shiitake (Lentinula edodes) mushrooms are included among the shroom mix. They are known to have antibacterial and antiviral effects, as well as having the ability to reduce inflammation. Setting the generous amount of copper and B Vitamins aside, know that they are great for your body, and excellent in your belly. A considerable bonus is that mushrooms cook fairly quickly, so it is easy to bake/stew multiple dishes at a time, saving this recipe for last, as it takes less than half an hour from start to finish. In the meantime, you can create an amazing keto seafood chowder, for an appetizing starter. 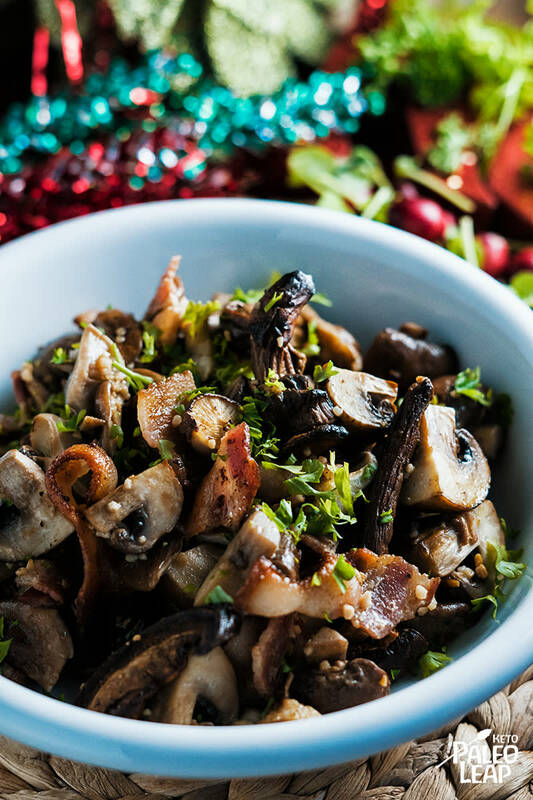 In a bowl combine all the mushrooms, bacon, garlic, ghee, and season generously to taste. Mix everything well and place in a small baking dish. Place in the oven and bake 18 to 20 minutes.